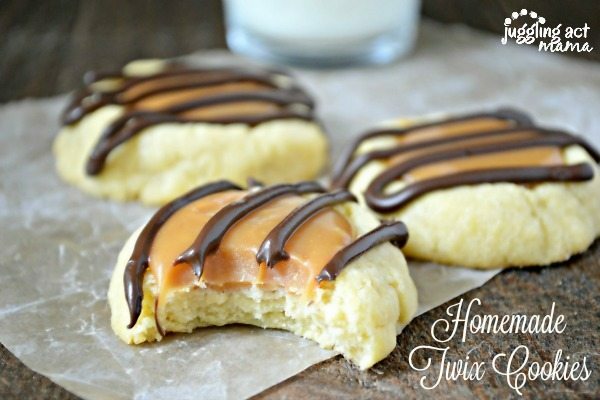 These deliciously buttery and sweet Homemade Twix Cookies will make everyone smile. 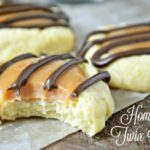 With layers of shortbread and caramel, drizzled with chocolate are the perfect #copycat #recipe. Raise your hand if you love Twix. You can’t see it but my hand is definitely raised. I love Twix. I actually love Twix so much, I was inspired to make Homemade Twix Cookies. It is a total copycat recipe for the candy. As a matter of fact, it might just be better than the original. 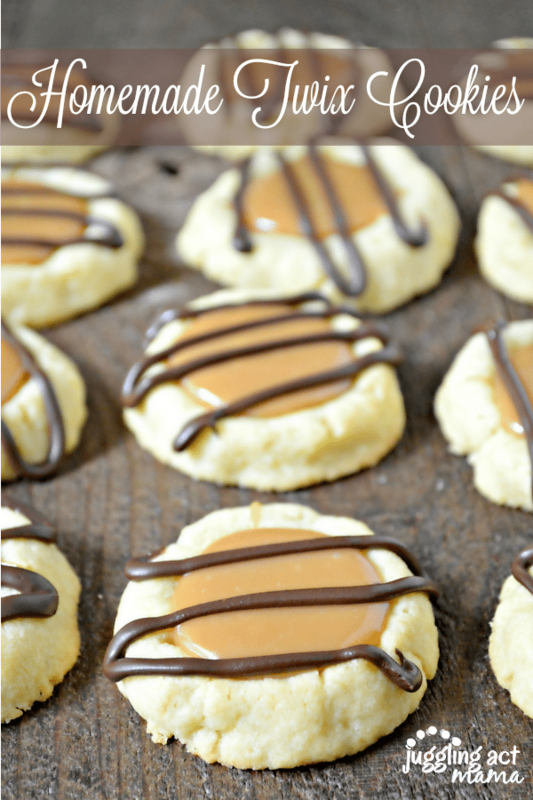 Trust me on this – it’s the perfect mix of shortbread cookie, caramel filling and chocolate. Combine ⅔ cup butter, sugar, egg yolks and vanilla in bowl. Beat at medium speed, making sure to scrape the bowl. Add flour and beat at low speed until well mixed. Cover and refrigerate until firm. Roll dough into 1-inch balls and place 2 inches apart onto ungreased cookie sheets. Press your thumb into the center of each cookie. Bake 7-10 minutes or until edges begin to brown. Melt the caramel and heavy cream in the microwave in 30 second intervals, stirring in between until it is fully melted. Fill each indentation with the caramel. Melt chocolate in a microwave stirring 30 seconds at a time until smooth. You can use a small piping bag OR a freezer bag with the corner snipped with kitchen sheers to spread a small drizzle over the top of each cookie. You can make ahead and freeze the shortbread dough. After the dough thaws, follow the steps for baking as normal. While I love a good candy bar for a quick fix, these cookies are totally amazing. They’re just so irresistible! 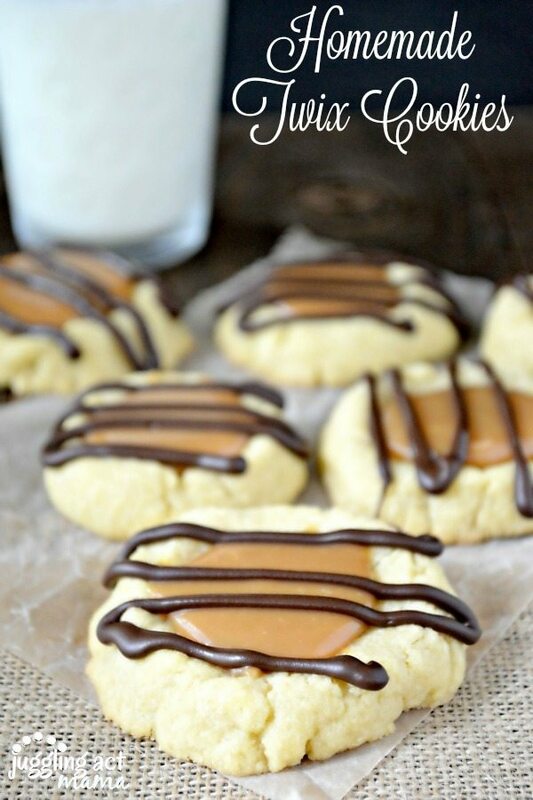 What do you think, would you make Homemade Twix Cookies? I bet your family and friends would LOVE these, so give them a try! Follow Juggling Act Mama – Ang Paris’s board Cookies on Pinterest. I made these for the holidays and they were a HUGE hit! EVERYONE asked for the recipe!